Alright, so this is the last of the harvest for 2010. 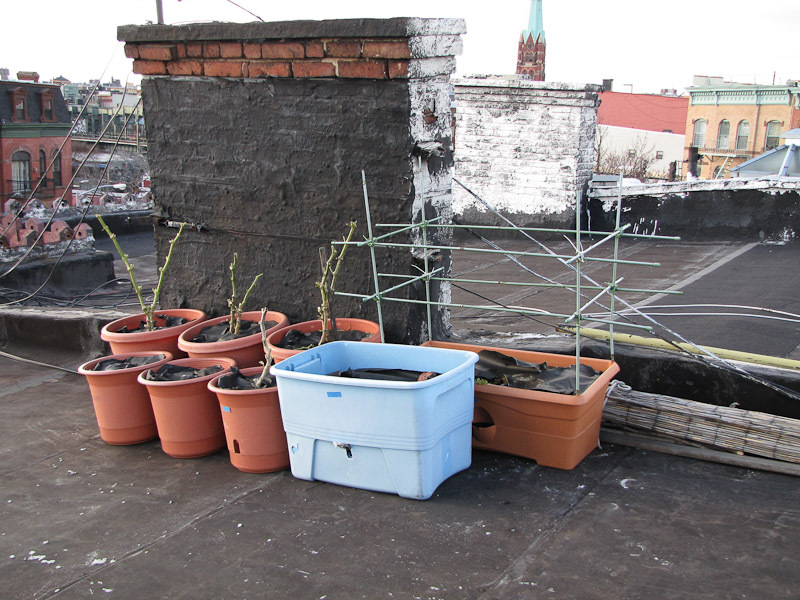 The rooftop vegetable garden is closed for the winter. I'm glad it's over because the weather up there is brutal! The wind burns your face and numbs your fingers within minutes. My gardening enjoyment declined precipitously with the colder temperatures so I've decided my cutoff date for all future rooftop gardening activities will be November 15th. I was able to beat last year's total even when I subtracted what was grown in the one new container added to the garden this year (the DIY self watering container from a water cooler bottle where I grew 5lbs, 4.5oz. of cucumbers). I was hoping for a greater improvement in terms of harvest weight per square foot of gardening space, but considering the garden and I survived a tornado I'm happy with how this year turned out. I see your aubergines made it through to November. How did you manage to keep your aubergines going through the cold weather? Mine unfortunately died... all 6 of them, and they were in such good form. Hi, I cut them down some time in October. They could have survived a little longer, but they looked so pathetic I decided to put them out of their misery.